Spruce up a boring door quickly with Schlage’s NEW Decorative Collections! I don’t know about you – but I am still addicted to Pinterest. I was there before the huge rush of people were interested in it a few months ago – and I continue to spend way too much time finding things that I want to do around my house. Fun part is – I have actually been able to complete some of the projects! One of the projects on my list was redoing our interior doors. Our trim and doors were orangey-brown when we moved in and I have painted and painted and painted to make it all white and I love the look! However, I still needed to do the doors. Product received for review. Post contains affiliate links. 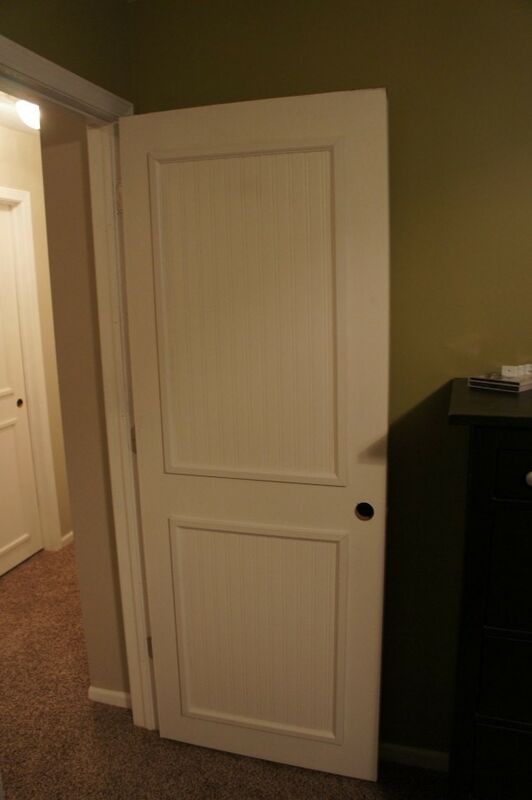 I was able to paint, and add some texture to them with wallpaper and trim to dress up the look (make-over for all 7 doors for under $80 total!). But they still needed something… doorknobs perhaps? Schlage has recently introduced their Decorative Collections. You get to choose the look you want and the finish you want – leaving over 1,000 different combinations in your hands! I was so excited to review these because I got to choose the look I wanted. I choose the Camelot Collection with the Accent Lever. I was torn between the look of the Oil Rubbed Bronze and the Satin Nickel, but I eventually decided the Satin Nickel might be something that wouldn’t go out of style for awhile (but hey, what do I know?). 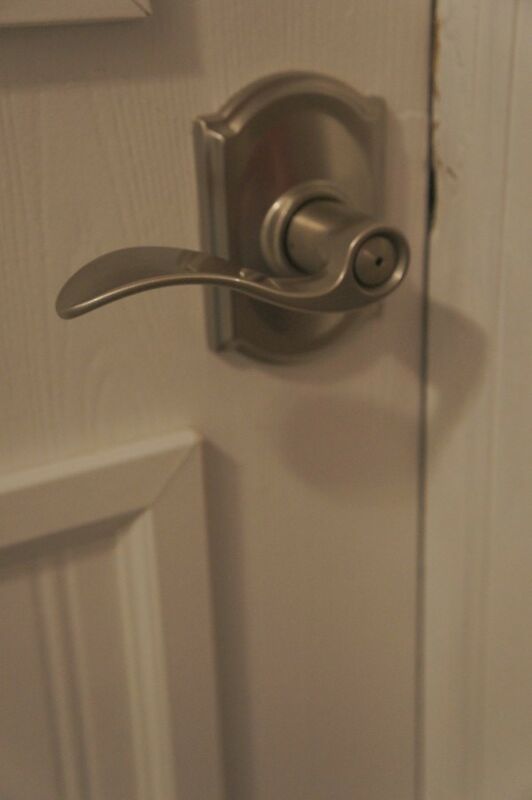 Before starting, I knew door KNOBS are easy to install – I found the lever to be easy, but it took a little more thought than a door knob to make sure everything was going the right direction. The directions are easy to follow, and it is only a couple screws you have to tighten to get the new lever (or knob) installed. TaDa! New door knobs, and a much classier look than the scratched up brass ones (or missing ones because of the foreclosure). You can find a selection of the Decorative Collection at your local hardware store – or you can go online and figure out what you want with the Schlage Style Selector and find a retailer that has the look you want. I’ve honestly never replaced a door knob before but those are certainly pretty neat! What a great way to spruce up a room! Wait, that bead board is wall paper? They look GREAT! Love your door makeovers! Ours are white but they are plain and boring. It’s amazing how easily you can make a difference. You’ve inspired me!